The Cardinals have claimed righty Merandy Gonzalez off waivers from the Giants, per a club announcement. Southpaw Brett Cecil was moved to the 60-day injured list to create roster space. The 23-year-old Gonzalez didn’t have a stirring performance in 2018, leading the Marlins to dump him from their 40-man roster. But he has drawn no shortage of interest from clubs that like the raw tools, with the Cards now following the Giants in being willing to commit a roster spot to get a first-person look. The Cardinals announced this afternoon that lefty Chasen Shreve has cleared waivers following this week’s DFA. He’s been assigned outright to Triple-A Memphis. While Shreve does have enough service time to reject the assignment, electing free agency would mean forfeiting the $900K salary to which he’d agreed earlier this winter. The 28-year-old Shreve came to the Cards as part of the now-lopsided deal that sent Luke Voit to the Yankees last summer. Over the past four seasons, Shreve has posted a solid 3.85 ERA and missed bats (10.3 K/9), but he’s also been far too prone to walks (4.7 BB/9) and home runs (1.8 HR/9) for either the Yankees or Cardinals to deem him a reliable bullpen option. Furthermore, he’s not a candidate for a more specialized role, as left-handed opponents have been even more successful against Shreve (.248/.335/.444) than right-handed opponents have been (.222/.316/.430). Cardinals infielder Jedd Gyorko is likely to start 2019 on the 10-day injured list, which will lead to roster spots for Yairo Munoz and Drew Robinson, Jenifer Langosch of MLB.com reports. Gyorko has been dealing with a calf problem throughout the month. He’ll be an important bench player for the Cardinals when he returns, having posted three straight above-average offensive seasons with the club over a combined 1,321 plate appearances. Matt Wieters has officially made the Cardinals’ roster as the backup to Yadier Molina, tweets Derrick Goold of the St. Louis Post-Dispatch. 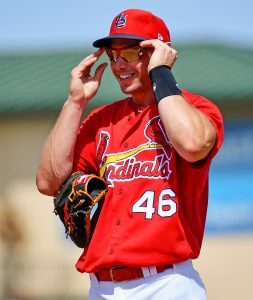 Wieters, who signed a minor league deal in February, will have his contract selected, and the Cardinals will designate left-hander Chasen Shreve for assignment to make room on the 40-man roster. Meanwhile, Jenifer Langosch of MLB.com tweets that outfielder Tyler O’Neill and right-hander Mike Mayers have both been informed they’ve made the Cardinals’ Opening Day roster as well. Wieters, 32, has been beset by injuries in recent seasons as his offensive output has slowly deteriorated. The once-vaunted prospect and three-time All-Star most notably had Tommy John surgery in 2014 and also underwent hamstring surgery last season. He’s also missed time due to an oblique injury in recent years, and over the past three seasons he’s compiled a pedestrian .235/.303/.376 batting line. Even that modest output from Wieters is worlds better than the Cards received from their backup catchers in 2018, however. Francisco Pena totaled 142 plate appearances but mustered a bleak .203/.239/.271 slash, while the since-traded Carson Kelly looked overmatched in a minuscule sample of 42 PAs as he hit .114/.205/.114. Pena also struggled with both framing and throwing out runners in 2018, so Wieters should present a definitive upgrade, even if he’s no longer a premier player at his position. Shreve, 28, will ultimately pitch just 14 2/3 innings in a Cardinals uniform. The southpaw came to St. Louis in what now looks to be a remarkably regrettable trade with the Yankees, as Luke Voit burst onto the scene in New York late in the 2018 campaign and batted .333/.405/.689 with 14 home runs in 148 PAs down the stretch. Over the past four seasons, Shreve has posted a solid 3.85 ERA and missed bats (10.3 K/9), but he’s also been far too prone to walks (4.7 BB/9) and home runs (1.8 HR/9) for either the Yankees or Cardinals to deem him a reliable bullpen option. Furthermore, he’s not a candidate for a more specialized role, as left-handed opponents have been even more successful against Shreve (.248/.335/.444) than right-handed opponents have been (.222/.316/.430). With Shreve no longer in consideration for a bullpen role, it appears likely that Tyler Webb will open the season as the second left-hander behind Andrew Miller in manager Mike Shildt’s bullpen. Brett Cecil is expected to open the 2019 season on the injured list. The out-of-options Mayers needed to either make the Opening Day roster or be designated for assignment. O’Neill has minor league options remaining but will make the club as a bench option behind Marcell Ozuna, Harrison Bader and Dexter Fowler for the time being. It’s not difficult to envision the slugger eventually playing his way into a larger role, though Fowler (as with Cecil) seems likely to get a chance at redemption due to his sizable contract.